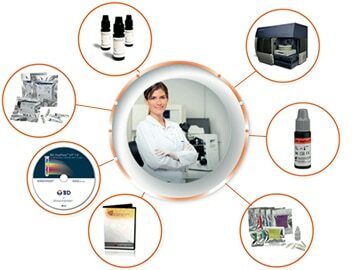 Built on the research and validation work of the EuroFlow™ Consortium* on the characterization of haematological malignancies for improved accurate diagnosis,1 the innovative BD OneFlow™ solution brings the standardization of leukaemia and lymphoma immunophenotyping one step forward, maximizing laboratory efficiency and enabling reliability and accuracy of results for clinical decisions and ultimately patient outcome. More on the EuroFlow Consortium’s efforts to standardize screening and classification of haematological malignancies. Designed to address the challenges of a clinical laboratory, BD OneFlow™ enhances operational efficiencies and simplifies instrument and assay standardization. Watch the video series. 1 J.J.M. van Dongen, L. Lhermitte, S. Böttcher, et al on behalf of the EuroFlow Consortium (EU-FP6, LSHB-CT-2006-018708). EuroFlow antibody panels for standardized n-dimensional flow cytometric immunophenotyping of normal, reactive and malignant leukocytes. Leukemia 2012, 26 (9): 1908-75.